EYEBROWS – TO LIFT OR NOT, AND HOW? All kidding aside, eyebrows convey emotions. Just look at these images. They also send signals about the physical state of the person. Low eyebrows can make a person appear fatigued, even sleepy. If your goal is to convey an energetic persona to your date or a potential employer, change may be in order. People have been enhancing and changing their eyebrows since antiquity. Plucking, applying makeup, dying, and as of late, “Botox’ing” are all nonsurgical techniques used to alter eyebrow appearance. Botoxing? Botox injected into the crow’s feet area will weaken those muscles, allowing the forehead muscles to lift the outer corner of the eyebrow and thus giving a limited but nonsurgical brow lift. The forehead lift, also known as a brow lift, was first described ~100 years ago but began to grow in popularity ~50 years ago. It was originally done with what we call a coronal incision across the top of the head, from ear to ear. The forehead skin was then lifted down to the level of the eyebrows, muscles released between the eyebrows to reduce frowning, and the forehead skin then pulled upward and the excess trimmed away. The result from a coronal lift was a long scar across the top of the head, elevation of the hairline, frequent numbness of the scalp behind the incision, as well as the potential for thinning of the hair. It did, however, do a very nice job of lifting the eyebrows!! If overdone, however, it could produce some very unnatural looks. Enter the endoscopic brow lift about 20 years ago! The same forehead lifting was accomplished via several small incisions placed just within the hair along the forehead hairline. A surgical endoscope – same as a laparoscope or arthroscope – was inserted, allowing the surgeon to release the frown muscles between the eyebrows. The forehead skin was then lifted and held in place with internal sutures or absorbable tacks. The result was virtually no visible scars, no hairline elevation, less if any scalp numbness, and virtually no thinning of the hair. No wonder it’s become the predominant method of brow lifting! The endoscopic lift is termed a closed technique because of the minimal incisions. Endoscopes are expensive and require a fair amount of time for set up prior to surgery. Can you do the same thing via an upper eyelid incision? You can certainly release the muscles between the eyebrows. The trick is to lift the eyebrows and hold them in the proper position. One can do that to a degree by combining the upper eyelid lift incision with a short forehead incision at the hairline without using an endoscope. 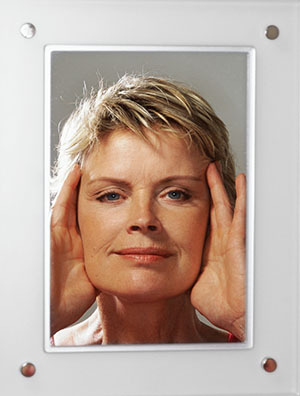 This technique is termed a transblepharoplasty brow lift. So how is a patient to choose between these three surgical techniques? Bottom line: There is not one technique that is perfect for everyone. • In my opinion, the open technique is the gold standard when it comes to brow lifting, giving the most powerful and complete treatment of the forehead area. I believe that an older patient with lots of drooping forehead skin does best with this approach. Men also tend to do best with the open approach because of their heavy forehead tissues that frequently overwhelm the weaker lift provided by an endoscopic technique. The reality, however, is that most men are not particularly concerned with their drooping eyebrows and are usually happy with an upper eyelid lift alone. In addition, men fear the feminizing effect that an overzealous lifting of their eyebrows can give. • Women tend to do well with an endoscopic approach. Many of these women prefer that the weakening of the muscles between the eyebrows be done with Botox as opposed to a release of the muscles in surgery. By so doing they avoid an over release of those muscles can lead to a spreading apart of the eyebrows as well as over elevation of the inner portion of the eyebrow, producing a “sad” look. The downsides to the endoscopic technique are the complexity of the equipment and the fact that it does not give as powerful lift as the open technique in my hands. When combined with an upper eyelid lift, though, the results are excellent. • Speaking of upper eyelid lifts; I almost always do an upper eyelid lift at the same time as a brow lift. It’s a rare patient who has drooping of the eyebrows without excess eyelid skin. If you really listen and observe patients when they talk about what they want with a forehead lift, they will tell you that they want a crisper look to the upper eyelid fold and to the corner of the eye where excess skin and eyebrow tissue are hanging down. To get that look, you need to not only do a modest lift of the eyebrow, but also trim away excess upper eyelid skin. To try to do this by lifting the eyebrow only often requires that the eyebrow be over elevated, something that patients despise and which has given forehead lifts a bad name! Better to do an eyelid lift at the same time!! • Finally, the brow lift via the upper eyelid incision has not proven to be as long lasting as the open or closed brow lift techniques. Your thoughts? Please feel free to comment.